Links are an essential part of any well designed PDF document. Clicking a link in a PDF document is similar to clicking a link on a web page. Links can take you to another location in the current document, to other PDF documents or files, to websites, play media files or even execute a menu item. Creating links manually is a tedious and time consuming process especially for the long documents. The plug-in provides a simple way to add links to text that matches external file names. The plug-in provides a method for adding links to pages in embedded PDF file attachments. The software provides a method for automatically linking multiple occurrences of the same (or different) text in a single PDF document into a hyperlink “chains”. The first occurrence of the search term points to a second one, the second one to a third one, and etc. The last occurrence of the search term is pointing back to the first occurrence of the term. Each link “chain” is a closed “loop” of hyperlinks that allows jumping from one occurrence of the text to another. The plug-in can automatically add interactive links to text strings that refer to page numbers such as "see page N", "see pages N-M", table of contents entries and just numbers. This feature is useful for adding page links to the table of contents, index table or other parts of the document that can benefit. Automatically add links to text that represents web URLs or email addresses. Control visual appearance of the links as well as processing page range. This functionality is also available as a batch command in Acrobat's Action Wizard. This plug-in provides functionality for adding links based on a text search. Text patterns are described using regular expressions. This is the most flexible method for the automated adding of links to variable text patterns that cannot be described as a simple fixed text. Page numbers, file names, web addresses, part numbers, phone numbers are common examples of such patterns. For example, you can add links to part numbers that will link them to the corresponding web page on your website. The plug-in can create links to pages, named destinations, external files and web addresses based on search results. This is an advanced feature that requires basic understanding of text matching with regular expressions. Easily inspect link actions using "Inspect Links" tool. Simply hover a mouse pointer over a link annotation, form button or file attachment annotation and see its action explained. Click here to read more about "Inspect Links" tool and see additional screenshots. The plug-in comes with a handy tool that displays all file and web references for a currently opened PDF document. File references and URLs can be directly edited by modifying a link's text. No need to browse for files or click through multiple dialogs. The software displays absolute and relative paths using different icons, and automatically checks file references for missing files. This is a must-have time-saving tool for link inspection and editing. The existing links from one or more pages of the document can be exported to a comma-delimited ASCII text file. Links can be edited and imported back into the document if significant changes to the link attributes are required. For example, it can be used to change target file names, named destinations, web links or page numbers. Exported ASCII file can be used as a template to transfer links to another PDF documents. Click here for a description of the export file format. The link import/export functionality can be effectively used to compile links from multiple sources into a single PDF file. This functionality comes handy when a team of users is working on the same PDF document. The ASCII text files (comma, tab, semicolon and space delimiters are supported) are an alternative way to add links to PDF documents. The easiest way to create such a file is to export existing links to a text format, edit link attributes using any text editor (Notepad for example) and then import it into a target document. This method allows to repeat one or multi-page link template multiple times to add links to a large PDF document. Click here for a description of the import/export file format. - Destination page number is out of correct page range (for "Go to a page view in current document" actions). - Referenced named destination does not exist (for "Go to a page view in current document" actions). - Destination file name is not specified (for "Open a file" and "Go to a page in another document" actions). - Destination file does not exist (for "Open a file" and "Go to a page in another document" actions). - URL address is empty (for "Open a web link" action). - Checks for proper URL formatting (for "Open a web link" action). - Every external file reference is labeled as either relative or absolute to aid in finding absolute path links (absolute path links will be broken if PDF document is moved to a different location). This functionality is also available as a batch command for quick processing of multiple documents at once. Link reports for individual PDF documents are saved into a single report file (in ASCII text format) to simplify file review and analysis. Missing destination files: link or bookmark is referring to another file that is missing. Software checks all documents in the set and suggests a file to link to based on a missing file name. Missing named destination: link or bookmark is refering to a named destination that is not present in the document. Invalid page reference: link or bookmark is refering to a page number that does not exist in a document. The plug-in is only able to assist in fixing the two first types of errors. The plug-in automatically suggests the best method to fix a particular error based on information gathered while checking the document set for errors. The software offers 4 possible methods to fix a file link error: move a file that exists in a document set into a different folder, adjust file links to point to another location, copy an external document into a missing file location, and delete link actions that contain errors. 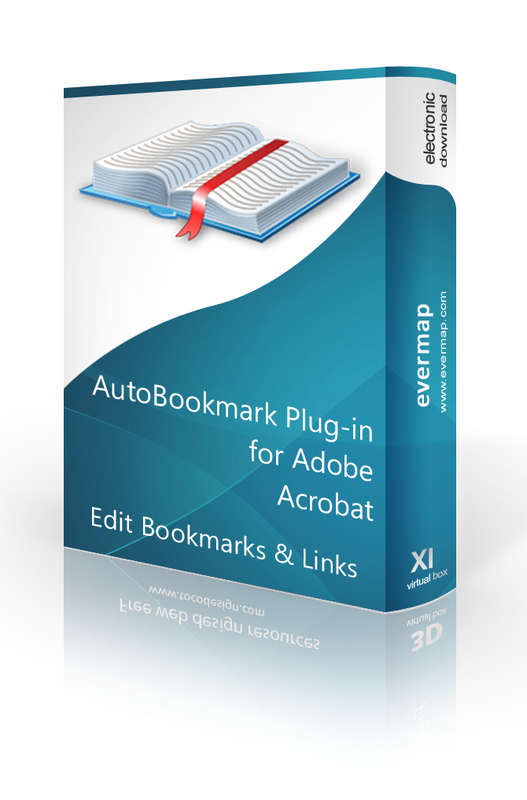 The plug-in provides several convenient functions for navigating between pages that contain link errors. All error mark-ups created by the plug-in can be easily removed with the supplied "Remove Error Markup" menu. 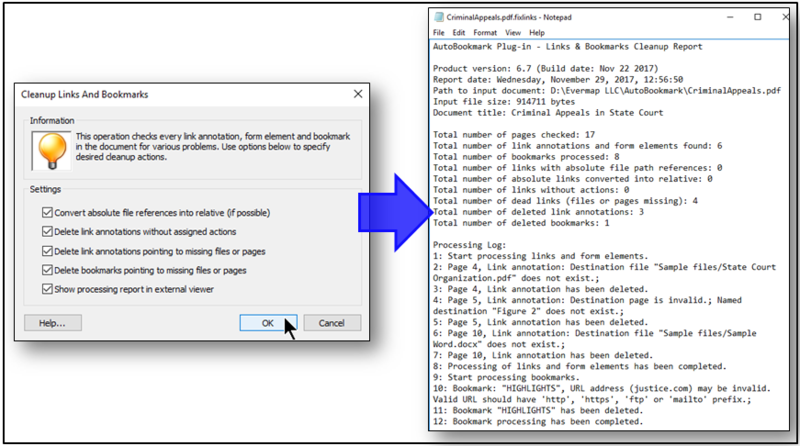 "Mark Up Link Errors" command is also available in the batch processing framework making it easier to find and mark-up errors in many PDF documents at once. Use the "cleanup" functionality of the plug-in to automatically inspect PDF documents and remove links to missing files or pages, links without assigned actions and automatically convert absolute path references into relative ones (if possible). Absolute links to external files are a common problem that most Acrobat users may eventually encounter. A full path or absolute path is a path that points to the same location on one file system regardless of the working directory of the document that contains a link. If a document uses absolute paths then it cannot be easily moved to another computer (unless this computer contains exactly the same path) or written on a CD without breaking a link. A relative path is a path relative to the current location of the document. Relative path will continue to work when a group of linked documents is moved into a different location or burned onto a CD/DVD. The plug-in can find and convert absolute file references into a relative ones if it is technically possible. Some paths cannot be converted into a relative form (for example, if a destination file is located on a different drive). The "Cleanup" operation generates a detailed report in a text format. Convert link actions to use "named" destinations instead of direct references to a page. Destinations are automatically generated from existing links. Named destinations enable you to set navigation paths across a collection of PDF documents. Linking to a destination is recommended when linking across documents, because unlike a link to a page, a link to a destination is not affected by the addition or deletion of pages within the target document. Named destinations can be also shared between multiple links or bookmarks within a document. For example, instead of using a direct link to page 10, a link will point to the named destination "Chapter 1" . You will be able to link to this location using a human-readable name instead of a page number. Change zoom type for all links in the document to one of the following: "Fit Page", "Fit Width", "Fit Visible", "Inherit Zoom", "Actual Size", "Custom View" or "Custom Zoom". This operation only affects links with "Go to a page in this document" and "Go to a page in another document" actions. Change the way Adobe Acrobat opens linked documents without manually editing every link in the PDF documents. The plug-in provides the functionality to change open window preference for all links (within a selected page range) to one of the following: "Window open by user preference", "New Window" and "Existing Window". Lock or unlock multiple links in PDF document with just couple mouse clicks. Locked links cannot be edited with Link tool or via link's "Properties" dialog. Links in Adobe Acrobat can be locked or unlocked manually via "Properties" dialog. However, it is a very time consuming process. The "Lock/Unlock Links" operation provides ability to lock or unlock links within selected range of pages or in the whole document just in few seconds. This operation is also available in the Action Wizard for batch processing. Delete all links from one or more pages of a document. All link types are processed. "Add Links By Text Search" - add links based on text search using regular expressions. "Add Links To Email Addresses" - add links to email addresses. "Add Links To Web URLs" - add links to web URLs. "Cleanup Links and Bookmarks" - convert an absolute file references into a relative, delete dead links and etc. "Convert to Use Named Destinations"- convert links to use named destinations. "Create Links From Dictionary" - automatically generate links for words and phrases. "Create Chain Links" - chain-link multiple occurences of the keyword(s). "Create Report" - create a link usage report, including file & URL dependencies and link errors. "Delete Links" - delete links from one or more pages. "Export Links To Text" - export links to a comma-delimited ASCII text file. "Import Links From Text" - import links from a comma-delimited ASCII text file. "Link "Page N" Text To Nth Page" - generate links to "Page N" text. "Link Numbers To Corresponding Pages" - link numbers in the document's text to corresponding pages. "Link Table of Contents To Pages" - add links to the table of content's text. "Lock/Unlock Links" - lock or unlock links. "Mark Up Link Errors" - mark-up link errors with sticky notes. "Set Appearance" - set the links visual appearance. "Set Open Preference" - set the window preference for opening external PDF documents. "Set Zoom Type" - set the zoom type for links pointing to page views. Check user manual for a complete up-to-date list of supported commands.